Rehearsal Space, Recording Studio, Website Service, Record Label. Pectus Excavatum is a condition that causes the chest to look hollow due to deformity in the growth of the ribs. 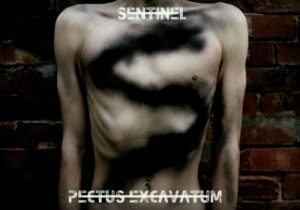 It can lead to cardiac and respiratory problems but I’m thankful to say, from the sound of Sentinel’s album Pectus Excavatum, there is no sign of the latter in Tom Watson’s vocals, nor any lack of heart in Louie Penfold, Dom Skinner, Richard Shearing’s playing. Consisting of three tracks, the album is a compact and incisive mix of catchy hooks, fast-paced beats and crisp riffs. New Dawn has an infectious drumbeat, melodic guitar swells and a great expansive chorus. Even though the band lists Killswitch Engage, Bury Tomorrow and Trivium as influences, this track made me think a little of Tool in places. The Crown is a gritty track with an even faster-pace, growled lyrics and a blistering solo followed by a swaying heavy riff pattern. I Am Lucifer begins like a gentle breeze but suddenly turns into a gale as full-strength sound and distortion erupts into a pounding assault that is only punctuated with, you guessed it, another hook-laden chorus. Sentinel tick the boxes for me when it comes to giving an opinion on a metal band. I love brutal music and harsh, shouted lyrics, but I always have a soft spot for a catchy and sweetly sung chorus. I guess I like the storm followed by the calm, before the next storm. Music without this dynamic grows a little boring and tedious for me. Sentinel avoid this pitfall and give the listener a saliva-filled gust of feeling, carried in the space that the more relaxed chorus gives. The band has a couple of gigs coming up at South Sea live, Broomhill, Sheffield in the next few months. The first is on the 19th April, the next the 30th April. I highly recommend you go and see them if you can, as if Pectus Excavatum is anything to go by, you are in for a treat.